“You always have two choices, your commitment versus your fear.” – Sammy Davis, Jr.
A lot of people have goals. They have valid reasons for why they need to accomplish the goal. They can even develop a plan and find support to help them do it. But if you are not committed to the process, at some point you won’t do it. 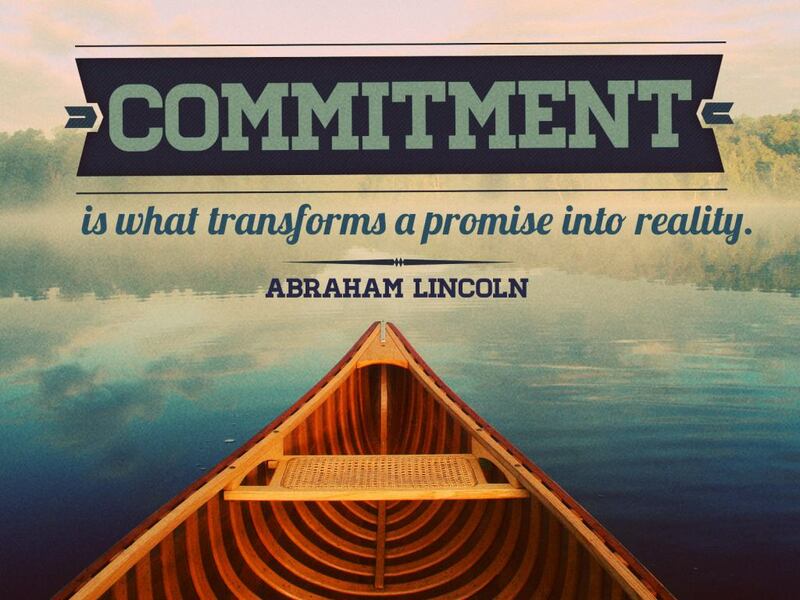 Commitment is easy to measure. Your commitment is directly related to the passion of the goal as it relates to the pain/discomfort to accomplish it. If your passion to accomplish your goal far exceeds the pain, then you will most likely stick to it. But once the pain or discomfort meets or exceeds the passion of accomplishing your goal, that is when people quit the process. It doesn’t matter if you are talking about weight loss, building a stronger marriage, playing professional sports, or going back to school. Once the love, or passion for the goal is equal to the pain of the process, usually we quit the process. Simply put, Commitment = passion/pain. When thinking of commitment in relationships, some men think of the “C” word as a negative. Commitment in our society is viewed as a prison or a shackle, rather than a vehicle for us to use to focus on fulfilling our God-given goal for our relationships. No man is scared of the commitment of marriage, if they are clear on who they are, and the legacy they desire to create with their family. As a professional athlete, I wasn’t scared of committing myself to football. At some point in my development, I understood that in order to fulfill my goals in football, I would have to commit to process of being a better football player. Which meant that I had to make adjustments in my preparation, diet, and other opportunities that could keep me from being the best wide receiver that I could be. Though there were many things I may of wanted to do, or things I wanted to eat, I understood that I would not be able to accomplish my goals without discipline. The same is true in relationships. Your commitment to your relationship will be short lived if it is based on external prompts. I will commit to you, if you commit to me. I will treat you right, as long as you treat me right. I will love you, as long as I feel loved by you. That is not how commitment works. That isn’t how love works. Your love and commitment to your relationship will only last when your dream for your family is so real that you are willing to do anything to make it happen. It doesn’t matter how long it takes, it doesn’t matter what the odds are, or how difficult it may be. Your dream for your family is what fuels your passion every day. It is that passion that your spouse and children feed off of. It doesn’t matter what the current state of your relationship is. When you begin to think, act, and talk to your family from your passion and love for them, you will be able to rebuild and rekindle what was lost. But you can’t rekindle something your your relationship that hasn’t first been rekindled in yourself. The question you must ask yourself is, What do you really want? Do you really want a happy marriage and family? If so, what am I willing to sacrifice in order to accomplish this goal? The answers to these questions will help you on your journey to rebuilding your relationship with your wife and children.